It’s always good to have a basic recipe in your cooking repertoire that can be used for lots of different dishes. A basic marinara sauce is just such a recipe. I used James River Cellars Meritage for this recipe, but you can just as easily use a Merlot, a Cabernet Franc, a Petit Verdot, or any other dry red wine that you prefer. I based this recipe on one I found in the latest Cooking Light magazine (Slow-cooker Marinara) but I really didn’t want to take the time to use my crock-pot, so I altered the recipe and came up with something that make more sense for my current timetable and needs. I hope you like it! Once the wine is incorporated, add the tomatoes and stir to combine. *See #4 on the photo. At this point, I covered the pan with foil and popped it into a 200 degree oven for about 2 hours. After baking the sauce, I removed it from the oven and used an immersion blender to smooth out the sauce. *See the final photo marked “YUM!”. I adjusted the seasonings by adding some salt/pepper and a little sugar to sweeten the sauce a touch, since our family likes a sweeter marinara. It’s now ready to use for a myriad of different dishes. Meatball sandwiches: For each sandwich, fill hoagie roll with meatballs (homemade or store-bought), top with marinara and sprinkle with mozzarella cheese. Broil sandwiches to melt cheese and serve. Portabella Mushroom sandwiches: For each sandwich, fill hoagie roll with sauteed portabella mushroom/spinach mixture, top with marinara and ricotta cheese, then broil to warm before serving. Veggie Mexican Pizza: On pizza crust, smear marinara sauce as you would tomato sauce, top with black bean and corn salsa and sprinkle cheddar cheese on top. Bake as desired and serve. Simple Italian dinner: Top pasta (macaroni) with Meritage marinara sauce and Parmesan cheese. Serve with garlic bread. This sauce is incredibly versatile and really tasty. Try it in any dish where you’d typically use a canned or jarred tomato sauce. It’s a great way to sneak vegetables into your family’s favorite meals and you can feel good that you’d made something healthy AND tasty. It’s one of my favorite things… making healthy foods that my family will love. Enjoy! This entry was posted in Cooking, Health, Recipe, Wine and tagged dinner ideas, easy recipe, italian, James River Cellars Meritage, Marinara sauce, pasta, sandwiches, vegetarian. 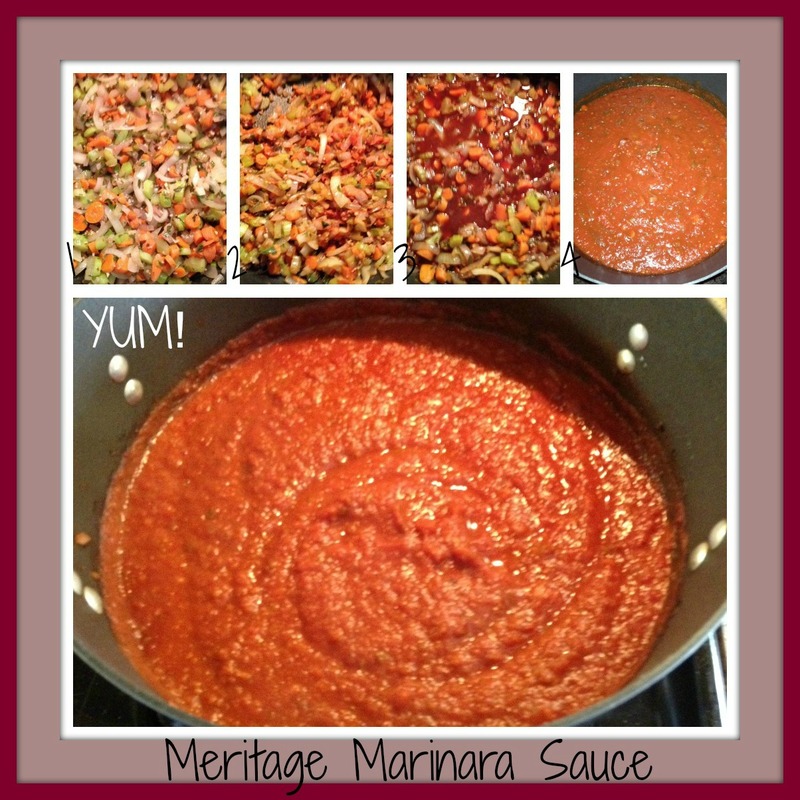 I have my own go-to marinara sauce recipe. Sometimes I get lazy with the pasta and just eat the sauce with a spoon like it’s soup!